Need a new pair of sunnies? Here's how to score a great pair of sunglasses at a great price, so you'll have more money to put towards your summer vacation. Coastal.com: Buy one pair, and you get a second pair free. Use the deal to get a pair for you and your significant other, or get a spare pair for yourself. There are lots of fun possibilities with this offer. Prive Revaux: All of their sunglasses are $29.95, and include free shipping, so you don't have to worry about falling in love with a pair that you can't afford. This is a favorite of many A-list celebrities. Warby Parker: They'll replace your sunglasses, if they get scratched in the first 12 months. Eye Buy Direct: They have options that start at just $11, and it only costs $20 more to add prescription lenses. Zenni Optical: You can turn any glasses on their site into sunglasses, so you have lots of options to chooses from, including many frames in the $30 range. Frames Direct: They have lots of designer brands and a price-match guarantee. Includes options in the $40-$50 range. Note that they also sell replacement lenses for many popular brands. 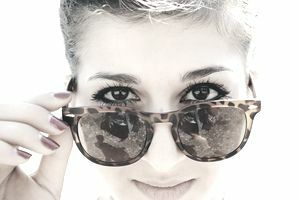 GlassesShop: Lots of statement-making, fashion-forward sunglasses. Non-prescription options are as low as $5.95, and there are lots of prescription options in the $40 range. Sunglasses need to do more than look good. They also need to fit well and do a good job of protecting your eyes. Happily you don't have to spend big bucks on a designer pair to get these things. Start your search by eliminating any sunglasses that aren't listed as offering 100 percent UV protection. Also consider eliminating any that aren't polarized. This special clear coating helps to eliminate glare, whether you're on the water, driving or skiing down the slopes. For longer-lasting shades, opt for a pair that comes with a scratch-resistant coating. Some companies offer this feature free of charge, and that's a good sign that you're buying a quality product. But quality isn't just about the lenses. It's also important to pick out a quality frame because your sunglasses will fit better and last longer, if you do. The best way to ensure you're getting good frames is to buy from a prescription eyewear company. This holds true even if you aren't purchasing prescription sunglasses. If a frame is designed to hold prescription lenses, it's probably also designed to hold up to lots of use and abuse—i.e. the kind of stuff you're going to put your sunglasses through. If you're looking to pick up a new pair of sunglasses from a brick-and-mortar store, shop August or later. By then everything will be on clearance. Otherwise, go ahead and buy your sunglasses now. With all the discount eyewear shops online, it's easy to get a great deal on sunglasses any time. If you have a Flexible Spending Account (FSA) or a Health Spending Account (HSA), you may not have to spend anything out of pocket to buy a new pair of sunglasses, since both prescription sunglasses and eye exams are on the list of eligible expenses. Check your account balance before you dive into your search for the perfect shades, so you'll know just how much you have to spend. Unfortunately, non-prescription sunglasses are a no go. Someone needs to convince the government that protecting your eyes now, so you don't have problems down the road is a worthwhile medical expense. Shopping for sunglasses because your current pair is starting to fall apart? If they're made by a big-name brand, you can probably buy replacement parts for them. A little-known secret in the optical world is that most mid-range and high-end sunglasses are made by a company called Luxottica, and they happen to have a website, where you can buy spare parts for many of the sunglasses that they produce. Pretty nifty.